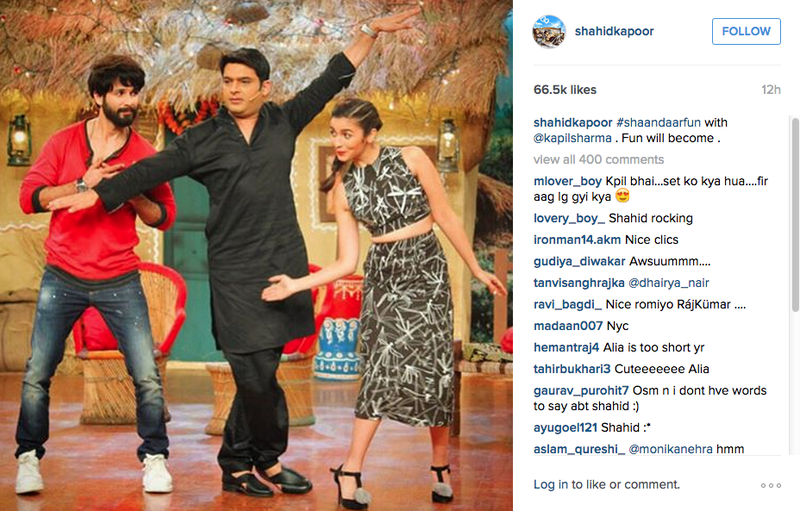 Photos: Kapil Sharma Flirts With Alia Bhatt And Guess What Shahid Kapoor Does! [tps_footer]Bollywood’s two amazing stars Shahid Kapoor and Alia Bhatt who will be seen in their much-awaited film ‘Shaandaar’ are currently on a promotion spree. Both Shahid and Alia have geared up for the promotion of the film. The duo are going to make their appearance on the hit show ‘Comedy Nights With Kapil’. 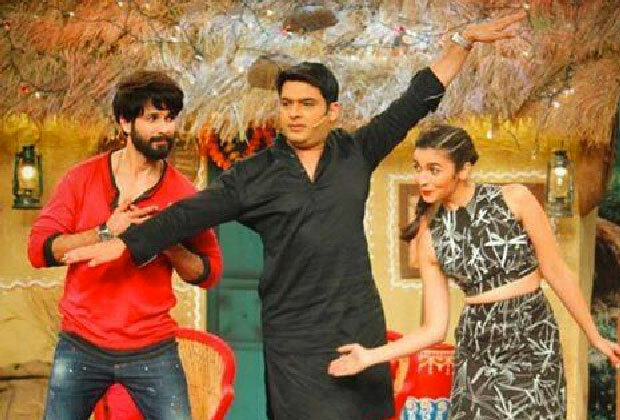 The ‘Haider’ actor Shahid Kapoor will be visiting on the sets of ‘Comedy Nights With Kapil’ with his co-star Alia Bhatt to promote his film ‘Shaandaar’. The actor will be seen answering questions from the audience, and will surely tickle everyone’s funny bones. As we all know ‘Comedy Nights With Kapil’ has always been the favorite platform of all the stars to promote their films. The show has been visited by almost all the biggies of Bollywood and this time we will see Shahid Kapoor and Alia Bhatt together on the show to entertain their audiences and fans in a very ‘Shaandaar’ way. 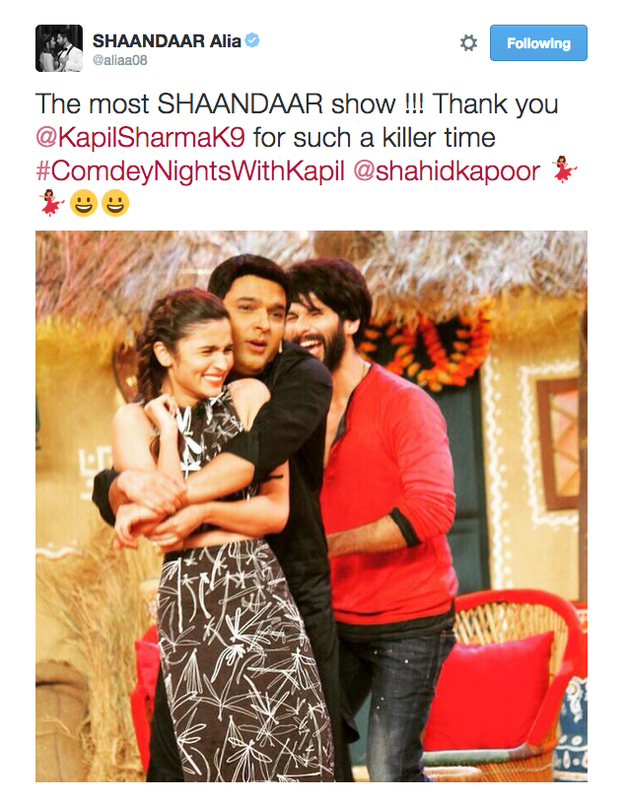 Well, the pictures already show how ‘Shaandaar’ this episode is going to be, agreed? Also See: Kapil Sharma’s Comedy Nights With Kapil To Be Raided! Talking about the film ‘Shaandaar’, directed by Vikas Bahl based on Shahid and Alia who will be playing insomniacs and the film is of an Indian family who land up in exotic location of London for the destination wedding where Shahid Kapoor plays the role of a wedding planner. The film will release on October 22. Previous articleWhen Salman Khan Embarrassed Sonam Kapoor And Told Her To Change Into Decent Clothes! Next articleThis Is How Priyanka Chopra Looks After 16 Hours Of Work!